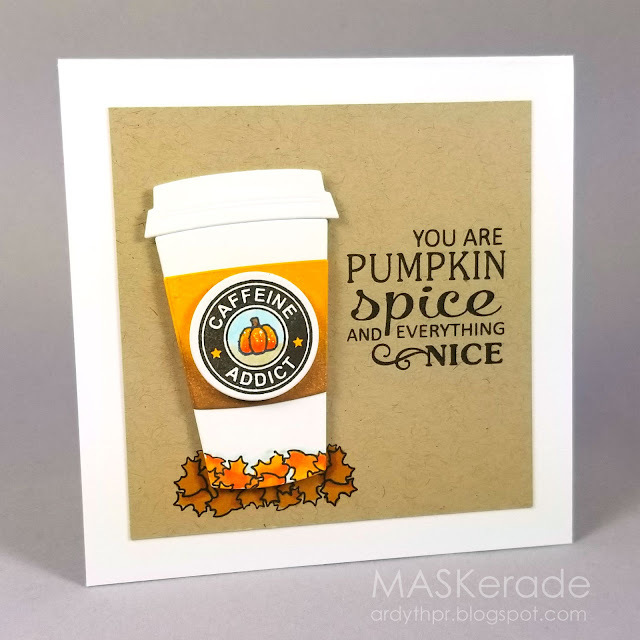 I'm playing along with the Fall Coffee Lovers Blog Hop today, using some of my favourite coffee-themed products from SugarPea Designs. I started by cutting the cup, lid and sleeve and then blended distress ink on the sleeve. I stamped the circular sentiment and found a little pumpkin to fit inside. I coloured that with Copics and then cut the circle and popped it up on my lid. I created a kraft panel and stamped the sentiment and pile of leaves using my MISTI. I then removed the kraft panel from my MISTI and stamped them again onto a post it note. Leaving the post it note in place, I positioned my cup so that I could stamp the leaves again with a portion of them on the cup. Love the glittery pumpkin on your cup sleeve and the fun leaves along the bottom! A great fall themed coffee card! Thank you for the inspiration... and reminding me to look at all my stamps for different sized images! Ardyth, now how perfect is this?! Your ink blending is AMAZING. I absolutely LOVE your sweet PSL card. Thanks for sharing! My favorite coffee and what a great card! Pumpkin Spice is my all time fav!!!! Gorgeous card, Ardyth!!! font of the sentiment, gorgeous. So CLEAN and lovely!!!! Yay for the Hop and Hoppers! Wow, I love this card! That cluster of leaves at the bottom is the perfect touch. So eye catching! Great design and love the colored sleeve! Beautiful! Love your card and the shading on the sleeve. it's beautiful. love the leaves! Love this card. The sentiment is great and the to go coffee cup I love the leaves you added on the bottom and continued on the card base. Beautiful beautiful card! Love it! I love your gorgeous card! It puts me in the mood for a pumpkin spice latte! Beautiful! Very sweet card, love the clean and crisp design!! Thank you for the inspiration. Love, love, love this beautiful card!!! Great card design and I love the leaves at the bottom of the cup. Beautiful card. That leaf stamping on the bottom of the cup is beautiful. I love the depth of colors and a beautiful card. Wonderful CAS card, Ardyth. Love the To-go cup nestled in the Fall leaves. Beautiful blending too. Beautiful coloring on a lovely card!